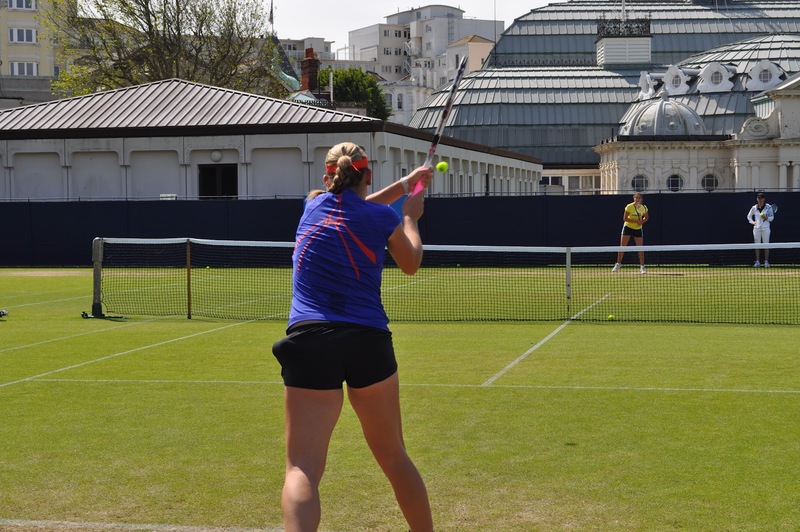 I love spotting players on the practice courts and that was where we headed first when I arrived at Devonshire Park. 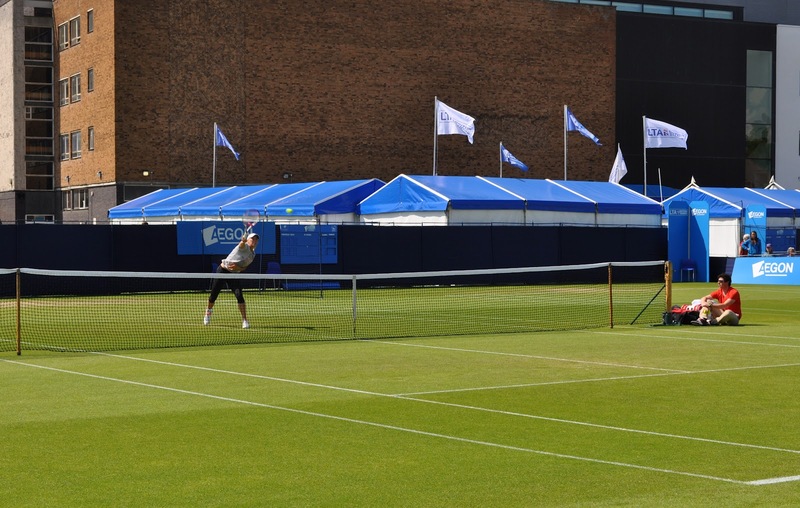 We saw Caroline Wozniacki practicing with her new coach, Thomas Johansson, while her boyfriend Rory McIlroy watched on. Lucie Safarova was looking in great form, hitting the ball very cleanly as she played with her coach. It is a mystery she has not done better on this surface because I think she has a great game for the grass. Laura Robson and Timea Babos were knocking up as were Maria Jose Martinez Sanchez and Tsvetana Pironkova, who were both looking lacklustre, but I learnt not to read too much into how the players were looking in practice! Kvitova was my tip for the title so I was disappointed to see her lose 7-5 6-4 to Makarova, who loves the courts here in Eastbourne judging on her previous results. Both players have similar games with the big lefty serve and crushing forehands to boot, but in the early rallies Kvitova had the heavier weight of shot and the match was played on her terms. Kvitova claimed the early break, but ended up losing the first set after serving for it at one stage. Makarova did nothing special in that first set, but she went about her game both quietly and efficiently, and was the more consistent player. Kvitova was increasingly error strewn in the second set and particularly struggled on the return of serve. When she is playing poorly, her tactics just seems to be to hit the ball harder when I think she needs to take a bit off the ball and play some angles. Kvitova managed to break back when Makarova served for the match however it was not to be her day. A good, not great match, which had the potential at the end to turn into a classic WTA chokefest, but Makarova finished the match well in the end. She will be a very dangerous floater at Wimbledon going into the draw unseeded… one to watch! After the Kvitova/Makarova match, we watched the last two games of the match on court two between Kerber and Vesnina. Vesnina was hitting the ball very hard, but Kerber was at her wily best with some excellent retrieval skills. She was very frustrated though and I noticed this in her last couple of matches at the French Open she was continually losing her temper. However she is still riding on her superb 2012 and has become a pro at winning three set matches. 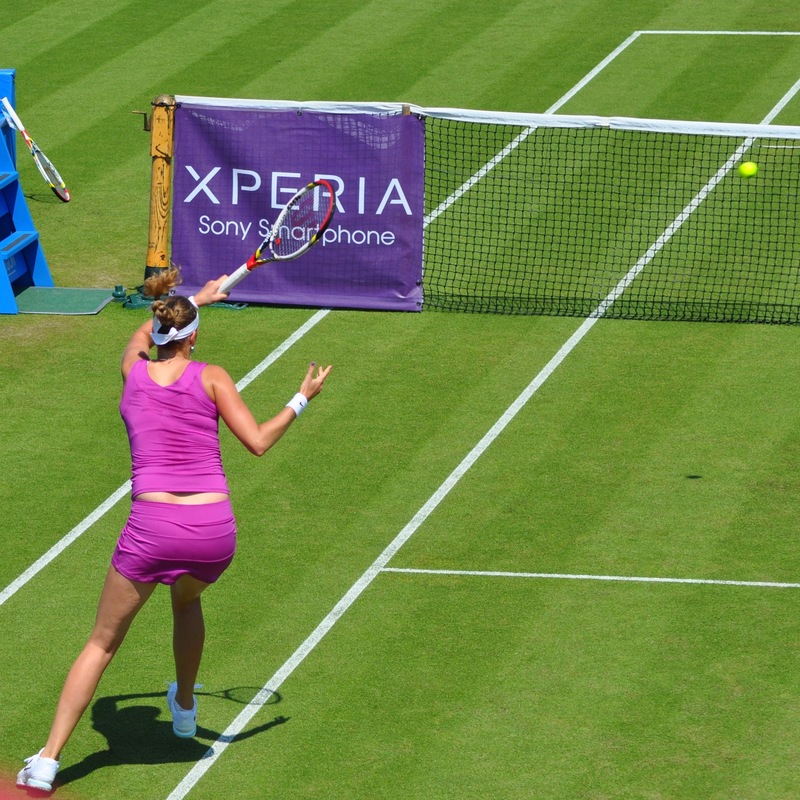 June 20, 2012 in Eastbourne, Kerber, Kvitova, Makarova.